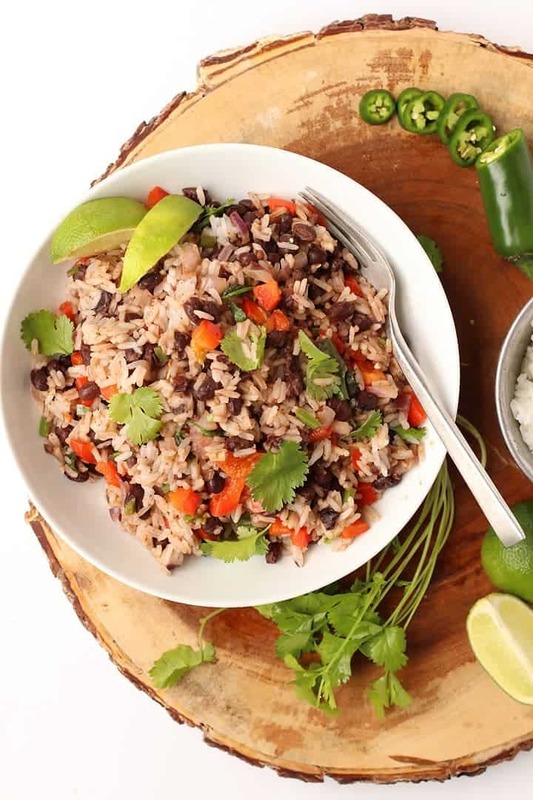 This 30-minute Black Beans and Rice recipe is filled with protein and packed with flavor for a wholesome vegan and gluten-free meal. Delicious and so easy to make, it should be part of your weekly rotation. 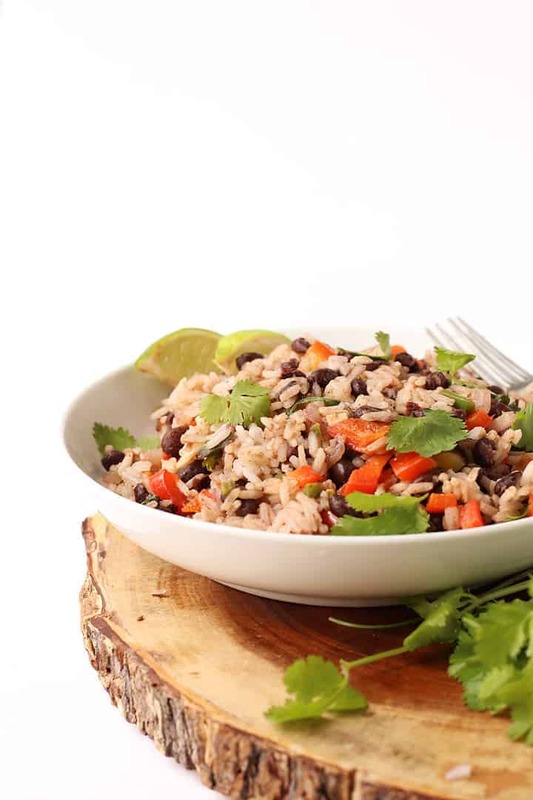 After 6+ years of blogging, I am finally sharing with you one of my the most frequently-made meals in the My Darling Vegan household: 30-minute Black Beans and Rice. I’m not sure why it’s taken so long to share this simple and wholesome meal; I suppose sometimes I forget that the most common meals still need recipes. In fact, some of my most popular recipes are among my simplest such as this creamy tomato soup and of course, these perfect vegan pancakes. And so, without further ado, here we go! 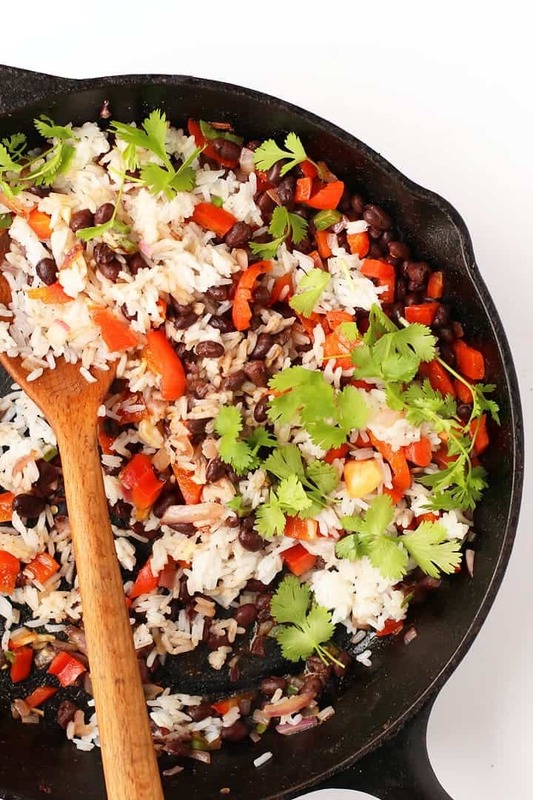 I think you’re going to love these 30 minute Black Beans and Rice. They are packed with protein, filled with flavor, and super quick to make. Best of all, this recipe is kid-approved by some of the pickiest eaters I know. It’s a meal your family will love AND you can feel great about feeding them. You may have heard before that beans and rice are among the few plant-based foods that, when combined, make a complete protein. This means that together they contain the 9 essential amino acids that our bodies cannot produce on their own. While it’s not necessary to eat complete proteins at every meal, it is important that everyone, especially those on a plant-based diet, is paying attention to this. The good news is that creating complete proteins is not hard on a vegan diet. When combining any bean or lentil with a grain like rice, quinoa, or whole wheat, you are getting all 9 essential amino acids, thus a complete protein, in your meal! These Black Beans and Rice are especially big around my house because it’s one of the few meals with complete proteins (and complex carbs and veggies) that my kids will eat. 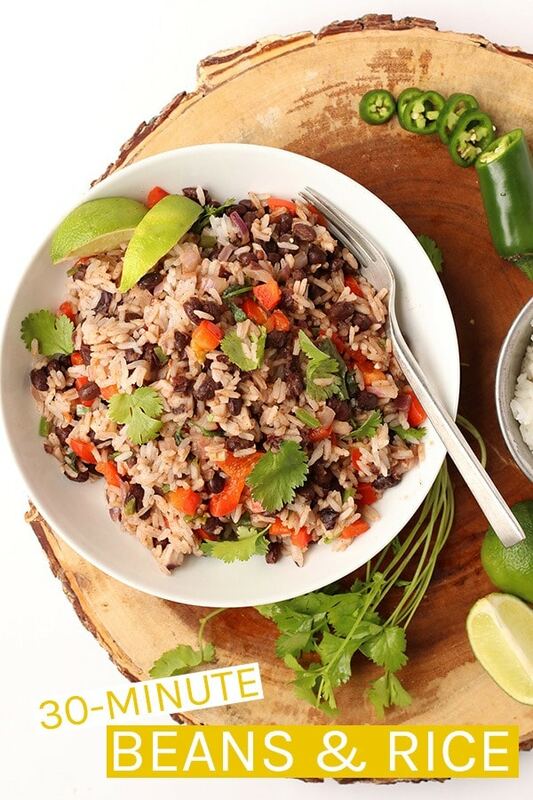 How to make these Black Beans and Rice? I’m glad you asked. Making this beans and rice recipe is so simple! They can be made in just 30 minutes for a hearty, protein-packed meal the whole family will love. In a large skillet, heat oil over medium heat. Add onions and garlic and sauté until onions are fragrant and translucent (about 5 minutes). Add bell peppers, jalapeño, and spices and stir to coat. Once the bell peppers are slightly tender, mix in the black beans. Once the rice is done, add it to the seasoned black bean/veggie mixture and combine. Divide between 4 plates. Top with fresh cilantro and lime and enjoy! 30 minutes. Check. Complete protein. Check. Vegan and gluten-free. Check. This recipe is highly versatile. 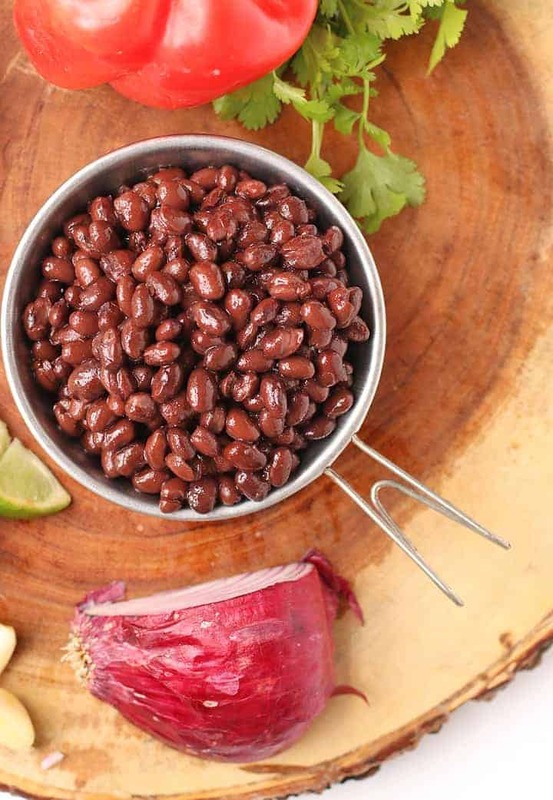 You can swap out black beans for kidney beans or pinto beans. You can also free to add any additional veggies such as zucchini, corn, and tomatoes. Beans and rice can also be made in an Instant Pot. For Instant Pot recipes, use dried beans. Set the manual mode to cook on high for 25 minutes. This meal makes great leftovers. Store uneaten beans and rice in an airtight container in the refrigerator for up to 4 days. To reheat, gently heat over the stovetop or in a microwave. Serve beans and rice as is or inside a tortilla, alongside some crispy tofu, or with lettuce for beans and rice salad. Just because a recipe is simple, doesn’t mean it’s not worth making. 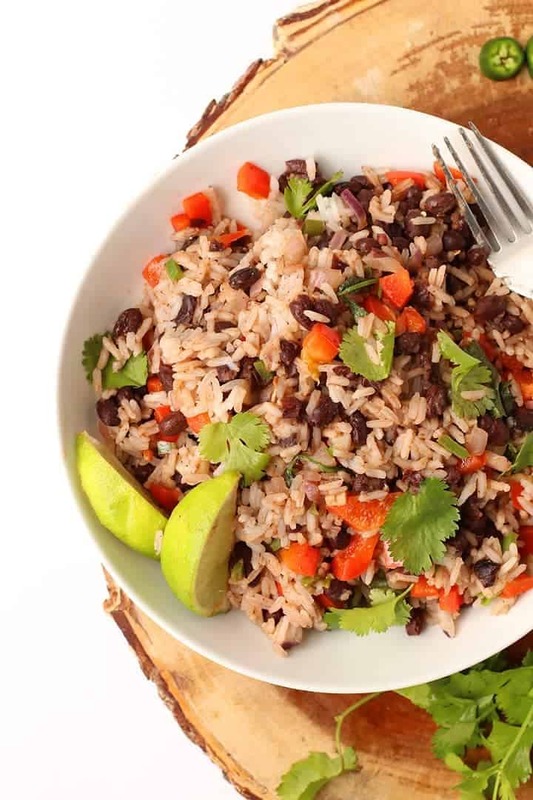 I highly recommend you give these Black Beans and Rice a try for a quick and filling dinner that will give you and your family a complete source of protein while filling up your bellies and satisfying your taste bud. Cook rice according to package instructions. While rice is cooking, prepare the beans. Add bell peppers and jalapeños and stir to combine. Stir in cumin, cayenne, salt, and lime juice. Add black beans, stirring until well combined, then bring to a simmer. Simmer for 5 minutes while rice continues to cook. Remove from heat. Stir in cooked rice and serve immediately with fresh cilantro and lime juice. I just made this last night and hadn’t tasted it. Honestly I wasn’t looking forward to eating it because it looks boring, but I was shocked that it was so good!! I just made this, with added kale and broccoli and it was so delicious, will definitely make again. I used more cumin and lime juice, that’s just personal taste. Brilliant recipe! This was very good. I squeezed a little extra citrus on at the table because I am a citrus lover. I would definitely make it again. Thanks for a good recipe! Not very spicy. My kinds don’t mind the jalapeño in it and they are pretty sensitive to spice. However, you could half or omit the jalapeño all together if you’re concerned about it.